Next to the brain the most important organ in the human body is the heart. There would be no need for the heart if there was not a system by which the heart could transport its’ most important product, the blood. 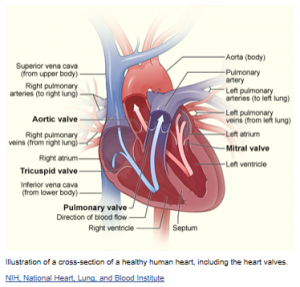 So, I thought we might begin some blogs to look at the heart and learn more about circulation of the blood. We shall begin by looking at the engine which provides the power and get a rudimentary understanding of what goes on in this wonderfully designed pump that can last for up to a hundred years, in some cases, and never miss a beat. This is by no means a text book on the heart. But many of us have no idea what our heart is made up of. We shall get a snap shot of the main parts which make up our heart and how they work. We shall begin with the Aorta. The aorta is the largest artery in your body. It’s main job is to carry oxygen rich blood out of the heart to all the parts of your body. When the blood returns it enters the Atria. 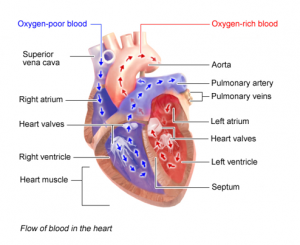 The blood returning to the atria is de-oxygenated, or low in oxygen. The heart has four valves called Cardiac Valves which regulate the flow of blood through the atria(chambers) mentioned above. The Heart Ventricles are the lower left and right chambers of the heart. There is a stout wall which separates the ventricles which is called Interventricular Septum. The main muscle of the heart is called the Myocardium. It lies in the middle of the three layers which make up the wall of the heart. The Pulmonary Artery carries de-oxygenated blood from the heart to the air sacs of the lungs. The Pulmonary Veins bring oxygenated blood from the lungs to the left atrium of the heart. Two other veins are the Superior Vena Cave and the Vena Cave. The Superior brings blood from the head, neck, arms and chest to the heart. The Vena Cava brings blood from the head, neck and extremities. The purpose of arteries is to carry blood away from the heart. The largest artery in the human body is the aorta. Every artery in the body is connected directly or indirectly to the aorta. 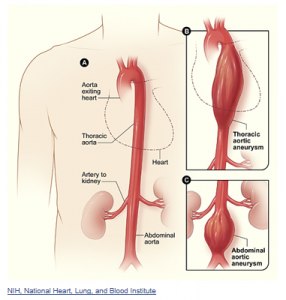 The aorta ascends from the heart and then arches and descends through the core, or thorax of the body. To get a better understanding of the atria see the picture below which shows the flow of the blood to and from the atria. If you have ever worked with any type of pump, you know that an efficient valve system must be in place. The heart is no different. The heart employs two types of valves. They are the semilunar and the atrioventricular. When ventricular flex, the atrioventricular close to prevent a back flow of blood to the atria. When the ventricles relax the semilunar valve closes to prevent blood from flowing back into the ventricles. Blood circulation begins when the heart relaxes between two beats. When this happens blood flows from the atria, which are the two upper chambers, into the ventricles, which are the lower chambers. The ventricles, which were relaxed, now flex and expel the blood into the large arteries, the right going to the lungs and the left to the aorta. 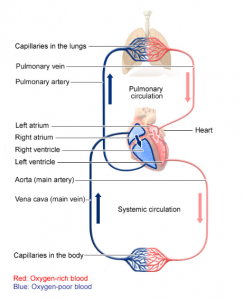 In the systemic(pertaining to the system or body) section the ventricle pumps the blood into the aorta which distributes it to various parts of the body where it delivers oxygen and nutrients and takes on carbon dioxide and wastes. It now enters into the veins and travels back to the right atrium and into the right ventricle. Now, the right ventricle contracts and pumps the oxygen poor blood into the pulmonary artery which takes it to the lungs where the wastes are expelled and the blood takes on fresh oxygen. It then leaves the lungs through the pulmonary vein and heads back to the left atrium of the heart where the process begins again. Though I have very simplistically described the process about circulation of the blood, you can see that it is dependent on a lot of intricately balanced processes. We shall continue to look at these processes in the coming days and weeks just to see how magnificent a creation that the human body is. As we continue to look into this subject it will become evident that the intricacies and timings and balances of so many things are necessary for life to be carried on. There are many who think that the living things which we observe came about by accident and that there is no design intended. Those people believe, and I stress that it is a “belief”, in what is called evolution. If you have read or heard of anyone who espouses evolution you will, with a little perception or critical observation, notice that there are seldom scientific evidences presented to support such a theory. If evidence is presented it is never empirical or repeatable. Those who have studied the human body, such as medical doctors and surgeons rarely allude to evolution. They are very much aware of the intricate balances which must be maintained for life to exist. It used to be that living things were thought to range from simple to more complex. With the discovery and growing understanding of DNA it has been found that there is no such thing as simple life forms. The “simplest” life forms are more complex than any machinery that humans have every conceived of, even more complex that our super computers. Just looking at the foundations of the circulatory system of the human body we find that the balance and timing of many different parts are necessary or the life sustaining blood would not get to where it must get to nor would it be able to deliver the things that it must deliver nor could it rid the body of the waste that it must. The Bible declared many years before medical science figured it out that, “The life is in the blood.” The evolutionist claims that this happened by accident. The Creator of all life designed it that way. The whole body system declares it. If you lose the blood, you lose life. There is a blood that gives life and gives it forever. That blood is the blood which Jesus shed when He gave His life for all mankind on the cross. Jesus became the spotless lamb whose blood was shed to pay the price for our sins. By receiving Jesus, you can claim His death as payment for your sin. His shed blood washes you and cleanses you from all your sin, past, present and future. Now you can really begin living. If you are looking to improve your health and gain new energy then click on this LINK. If you have trouble sleeping because of snoring problems, click on this link and look for the banner about snoring. LINK! You can get all your vitamins and supplements by clicking on this LINK.